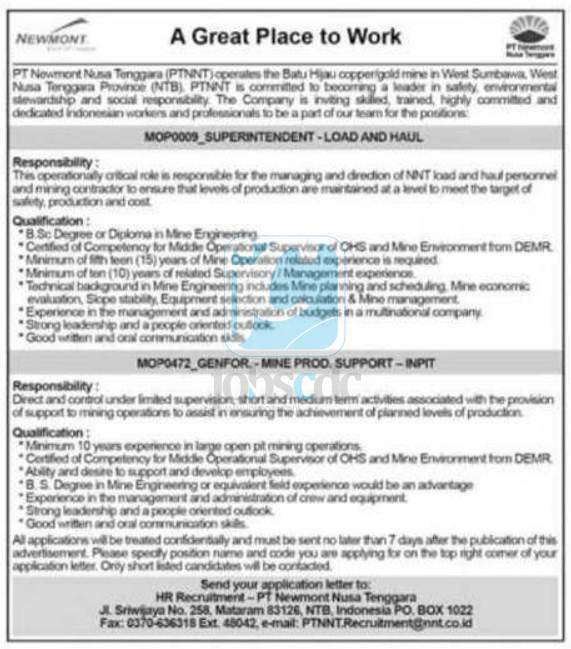 Loker PT Newmont Nusa Tenggara April 2013 – PT Newmont Nusa Tenggara – PTNNT is a leading mining company in Indonesia that deals with coper and gold mining, located in Mataram Lombok and having mining location in Batu Hijau Sekongkang West Sumbawa regency, West Nusa Tenggara Province. The Company commenced its commercial production in 2000.
not later than 7 days after the publications of this advertisement. Please specify position name and code you are applying for on the top right corner of your application letter.